Top Ten Tuesday is a weekly meme hosted by The Broke and the Bookish. 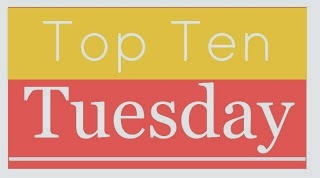 Each week features a book related topic that allows you to spotlight your Top Ten. I am going to stick with the bookish side of thankfulness for this post instead of the personal. Without their creativity and diligence to writing, I wouldn't have these wonderful worlds to visit. All of their hard work of getting a book together and published to put those beautiful books into my hands. They do a wonderful job of getting the word out on their new books. I have made so many new friends through blogging. It's a wonderful time chatting about books with y'all. The sales I find in these stores is wonderful and makes book buying delightful with the money saving...that allows me to buy even more! They make reading the most comfortable experience. Pretty book covers, how can you pass them up! I love my friends who are close by who read similar books that I do and will fawn over the characters with me. There is mo shame in book boyfriends. Such a wonderful website that allows me to search out new books I never would have thought to look for. It has been a wonderful opportunity to be able to read these books from authors/publishing houses and help get the word out on them...and the free books are an awesome bonus! There are so many things to be thankful for, it was fun to focus on the book-side of it!